Ah, there's nothing like a blast of fresh, frigid air to welcome you back to the planet after nearly a year cooped up in space. CAPE CANAVERAL, Fla. (AP) — Ah, there's nothing like a blast of fresh, frigid air to welcome you back to the planet after nearly a year cooped up in space. That's the word from astronaut Scott Kelly, NASA's space-endurance champ who returned to bitterly cold Kazakhstan on Wednesday, along with his roommate for the past year, Russian cosmonaut Mikhail Kornienko. In a NASA interview before heading home to Houston, Kelly said it was "amazing" to feel the cold air when the hatch of his Soyuz capsule popped open after touchdown. "I don't mean to say it's not fresh on the space station," he said, "but there's nothing like new cold air coming into the capsule." Both Kelly, 52, and Kornienko, 55, yearned for nature throughout their 340-day mission at the International Space Station, a dry run by NASA for eventual trips to Mars. "Just like Scott, I wanted to see Earth and I wanted to smell that fresh air. This is an unforgettable feeling," Kornienko said. It was the longest an American ever lived in space, although nothing new for the Russians. The world record is 438 days, set back in the mid-1990s at the former Mir space station. Even before that, a pair of Soviet cosmonauts had racked up a full one-year spaceflight. "Congratulations on your record," former cosmonaut and Kazak space agency chief Talgat Musabayev said at a welcoming ceremony. He couldn't resist: "Of course, it was already done 28 years ago." President Barack Obama joined the chorus of praise pouring in. "Welcome back to Earth, @StationCDRKelly! Your year in space is vital to the future of American space travel. Hope gravity isn't a drag!" Obama said via Twitter. The White House said Obama spoke with Kelly on Wednesday, thanking him for his service and for sharing his journey through social media. Kelly posted hundreds of photos of Earth. After landing, the latest one-year space subjects quickly parted company, Kelly flying back to Houston and Kornienko to Star City, Russia, near Moscow. While en route, Kelly tweeted a picture of his first salad back on Earth, noting it will be important to grow fresh food during Mars expeditions, like his space station lettuce crop. Kelly acknowledged it was bittersweet leaving the space station — his home since last March, currently staffed by three men until the arrival of three more in two weeks. "I'd been there a long time, so I looked forward to leaving. But at the same time, it's a magnificent place and I'm going to miss it," he said. Neither will be saying goodbye — in Russian, do svidaniya — to medical tests anytime soon. Minutes after emerging from their capsule, they were whisked in chairs to a medical tent where they did their best to stand, walk, jump, navigate obstacles — everything an astronaut might need to do immediately upon arriving at Mars. NASA aims to put astronauts on the red planet in the 2030s, but first wants to know how the body — and mind — will fare during the 2½-year expedition. Kelly ranked physical isolation aboard the 250-mile-high platform, from those he loved, as his biggest challenge. Kelly looked fit as he emerged from the Soyuz capsule on the remote steppes of central Asia, pumping his fist and giving a thumbs-up. He showed no signs of slowing down a few hours later as he waited to board the plane for the long flight back to Houston. He needed little if any assistance in walking and said there seemed to be little difference from his five-month station stint five years ago. The exams — along with blood, saliva and urine collections — will continue for weeks if not months. 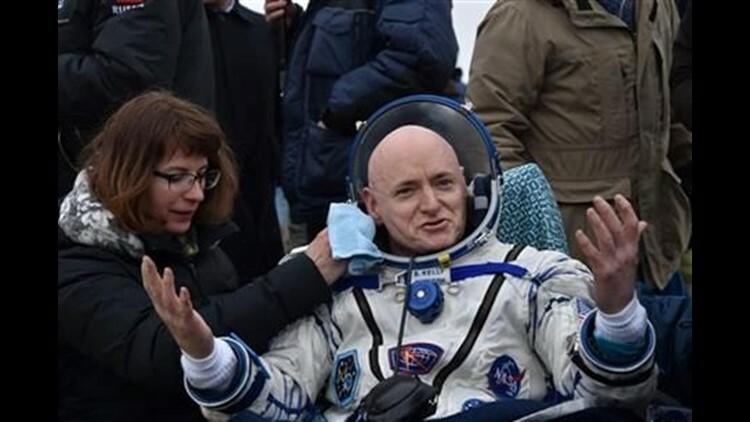 In the case of Kelly and his identical twin, retired astronaut Mark Kelly, the testing could last a year if not longer. The brothers served as guinea pigs — one in weightlessness, the other on the ground. Kelly's last tweet from orbit Tuesday provided a cliffhanger: "The journey isn't over. Follow me as I rediscover #Earth!" The brothers will be reunited at Ellington Airport near Johnson Space Center in Houston early Thursday. The welcoming committee includes Scott's two daughters, ages 21 and 12; his girlfriend who's been chronicling his mission as a NASA public affairs officer at Johnson; and his sister-in-law, former Arizona congresswoman Gabrielle Giffords, Mark's wife. Also joining in the celebration: Vice President Joe Biden's wife, Jill, and NASA Administrator Charles Bolden. As for his space legacy, Kelly said he and Kornienko "were a small part" in setting the stage for Mars. "Expanding our envelope and our ability to operate in space is something that's going to take us farther from this planet," he said. He stressed that it took thousands working behind the scenes to pull off this mission, noting: "It's really not about us." Maybe so, but their sacrifice was duly noted by grateful well-wishers at NASA and elsewhere. On this flight alone, the pair traveled 144 million miles through space — the average distance between Earth and neighbor Mars — and were exposed to cosmic radiation. They tackled 400 experiments, some of them unpleasant. And like other station residents, Kelly downed recycled urine and sweat — nearly 200 gallons over the year. Make no mistake, "a year's a long time," according to Kelly. He checked into the space station last March and by the six-month mark last September, "I felt like I had been up there my whole life." Six months is the typical space station stint; that was the mission length for Russian cosmonaut Sergey Volkov, who piloted Kelly and Kornienko to a safe Soyuz touchdown. "I'm definitely encouraged on our ability to go even longer," Kelly said. "I mean, even though I looked forward to coming home and there were things that I missed, I felt like if it was for the right reason, I clearly could have stayed however long it took."